How do you catch a runaway dog? With a TriMet bus! TriMet bus operators maneuver around many obstacles on the road: Heavy traffic, bicyclists, pedestrians – and even pooches. But on Tuesday, September 24 bus operator Leanne Terhune went from driver to dog rescuer. 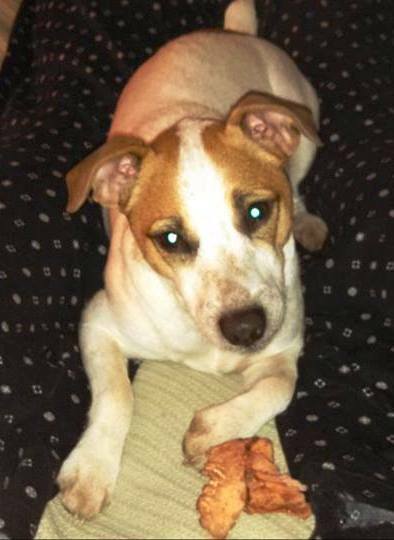 About 3:20 p.m. Sara Lee, a Jack Russell Terrier, escaped out of her back yard and headed for SE 32nd Avenue in Milwaukie’s Ardenwald neighborhood. At the same time Operator Terhune was driving a Line 75 bus down 32nd Avenue. Operator Terhune had to make a quick stop when the dog darted in front of the bus. She then looked over and saw Sara Lee’s owner, Coral Cox, waving her arms frantically. Seeing the panic in Cox’ face and being a dog lover herself – she has two dogs at home – Operator Terhune wanted to help. She watched as every time Cox got close to Sara Lee, the dog would speed away, likely thinking it was a game. Unfortunately Sara Lee darted out the open door just as quickly as she got on but Operator Terhune again called the dog back and again Sara Lee took the bait. She climbed back in and headed down the aisle. Although Sara Lee didn’t have change for a fare (no pockets) or a smartphone with the convenient new TriMet Tickets mobile ticketing app, since she’s only three years old she would have qualified to ride free, but mom soon reached the bus and put an end to Sara Lee’s life on the lam. While Operator Terhune wasn’t able to pull the bus out of traffic during the dog rescue since the road is so narrow, other drivers could see what was going on and didn’t seem to mind the brief delay. After all, “Nobody doesn’t like Sara Lee” or a happy ending.